As summer fades into the rear-view mirror and the sunny weather goes with it, you probably aren’t ready for golf season to end. The good news is that, unless you live somewhere with heavy snowfall, golf can be a year round activity if you are geared up for it appropriately. Having the right clothing and accessories at your disposal makes playing golf in the rain and cold a much more enjoyable experience than you ever thought possible. In fact, you just might enjoy playing in the off season even more than the middle of summer because the courses are less crowded, the rates are lower, and conditions are perfect for shooting low scores. One of the most key pieces of equipment for an all-weather golfer is a quality umbrella. If you try to play golf in the rain without appropriate cover, you will quickly become wet, cold, and disinterested. A good umbrella can shield you from the elements and keep you dry even on the ugliest of days. Quality golf umbrellas are large so as to keep you protected even from sideways rain, and will not turn inside out after a gust of wind. If you can sport one that represents your favorite golf brand and looks good at the same time, all the better. 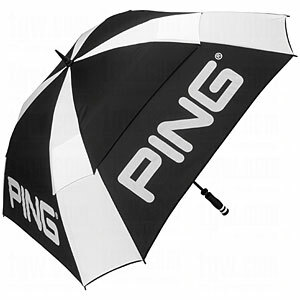 This umbrella is sure to please Ping lovers, although it will make a nice addition to any golfer’s bag. The Ping Double Canopy Tour Umbrella has everything you should be looking for in an umbrella. To start with, it is positively huge. Measuring 68″ across, you will be able to fit an entire foursome under neath the canopy – although you should probably tell your playing partners to go buy their own cover. It collapses down to a manageable size when the weather improves, and will easily fit inside your golf bag when all wrapped up. While the size is a great advantage, the ‘double canopy’ portion of this umbrella is what really sets it apart from the crowd. The double canopy design allows wind to pass through the umbrella while keeping water out. The end result is an umbrella that you don’t have to worry about turning inside-out while you are walking up the fairway in a rain storm. Built to last, this umbrella is reliable in the worst of conditions – if there is too much wind for this umbrella to handle on the course, you probably should just call it a day and head to the 19th hole. Not only relegated to winter duty, the Ping Double Canopy Tour Umbrella also provides excellent shade from the sun during those blistering July afternoons. With a push button opening mechanism and high-density fiberglass ribs, you will be able to rely on this addition to your bag for many years to come. Simply purchase this umbrella, place it in your bag, and forget about it. When the time comes to put it into action, it will be right there waiting for you. Even for the best golfers in the world, shooting 59 is nearly an impossible task. When Jim Furyk managed to shoot that magical number recently at Conway Farms as part of the PGA Tour Playoffs, he was only the sixth man in PGA Tour history to do so. Greats like Tiger Woods, Phil Mickelson, Jack Nicklaus, and Arnold Palmer have all seen the highest points in the game – but never laid claim to that milestone in official competition. In order to shoot such a ridiculous score, a golfer needs not only to hit great shots, but to make nearly every putt he or she looks at for the entire round. In order to reach 59, Furyk made a whopping 11 birdies and 1 eagle, along with a bogey during his round. Obviously, he was putting extremely well to record 12 under par holes during an 18 hole round. Naturally, golfers will quickly be looking to find out what putter he employed during this magical performance. The club in question is the Odyssey Versa #1 Wide, in the White finish. Odyssey has been the well-known putter division of Callaway for many years, and this accomplishment is just another feather in the cap of this popular putter line. If you are considering adding this putter to your own bag and trying to capture some of the magic that Furyk has experienced, you will find that is offers many benefits for the average player just as the tour professional. First, the Versa #1 has a great classic shape that more traditional players will enjoy. It is a heel-shafted putter that uses the White Hot insert to provide a smooth and effortless roll. The putter releases nicely through the ball, and doesn’t have the ‘pushing’ feeling of some modern mallet designs. If you have a short, aggressive putting stroke (much like the one Furyk uses), you are very likely to enjoy putting with this model. One look at the Versa #1 will make it clear that the traditional design is left behind when it comes to the paint finish on the head of the putter. 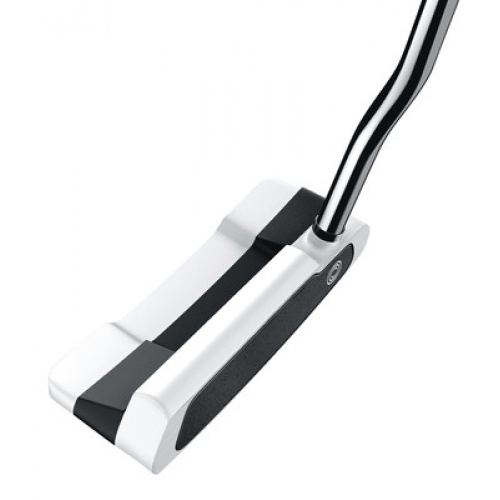 A contrasting white-black-white finish is used to create distinct lines on the putter head. This is not only for style – it serves a real purpose when you are trying to line up your putts. Standing over the ball, your eyes will naturally be drawn to the parallel lines on the putter head created by the paint job. If you are able to orient those lines perpendicular to your intended target line, you will know quickly and easily that you are aimed correctly. That process isn’t as confusing as it sounds – in fact, many users report their aim to be improved without even consciously thinking about it. If the white-black-white finish isn’t exactly for you, the putter is also offered with the inverse black-white-black paint. Either way, you will be getting a putter that feels great at contact and gets the ball rolling quickly on your intended line – what else could you ask for? While you might not post a 59 like Jim Furyk, you will be well on your way to improved putting when the Odyssey Versa #1 Wide makes its way into your bag. Most of us golfers are guilty of the same sin at some point in our playing history. We see the players on TV hit those great looking wedge shots into the green that bounce once and spin quickly backwards – and we want to do the same. Not only does this kind of shot require excellent technique and clean contact with the ball, but it also requires the right equipment. You need a wedge with fresh grooves and a golf ball that has a high spin rate. Mix that all together and you will get a shot that dances all-around the green when it lands. So what is wrong with that? Well – nothing is wrong with that shot, if you can execute it. The problem is that you will have to play that golf ball all the way around the course, including on your long shots with a driver and long irons. A high spin ball means it is high spin all of the time – and that spin is not always backspin. Any side spin you impart on the ball will be amplified by a high spin ball, meaning your slices and hooks become worse. Unless you possess the ability to control your ball flight consistently, you will probably be doing more harm than good with that premium, high spin golf ball. 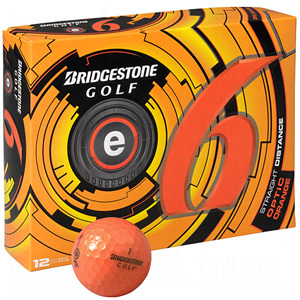 Enter the Bridgestone E6 golf ball. This ball is aimed at solving that problem by offering you a soft feeling option that keeps the spin rate down so your shots fly straighter. This is not just marketing speak – it actually works. You will enjoy the soft feel of the golf ball when chipping and putting, but your long shots will have less side spin and will hold their line in flight much better. The end result is you being able to keep the ball in play more often, and your scores going in the right direction. Low spin golf balls of the past have had a reputation for being as hard as rocks and nearly impossible to chip and putt successfully. That is what makes the Bridgestone E6 such an incredible jump in technology. No longer does the player have to pick between the two options of having a low spin ball that goes straight, or having a ball that is nice and soft for around-the-green control. The best of both worlds does exist, and it is found in the E6 golf ball. If you like to break out from the norm when you play, the E6 is also offered in a wide variety of colors like orange and yellow. Or course, for the traditionalists in the crowd, white ones are readily available as well. While the Bridgestone E6 is not likely to be the ball that will help you spin your wedges backward on the green, it can do just about everything else. From watching your drives fly long and straight to seeing a chip shot land softly and nestle up next to the hole, you will love what you get when you put the Bridgestone E6 into play. Pick up a box today and notice the difference the next time you hit the links. Walking a golf course and carrying your clubs is one of the purest ways to experience the game. If you are playing a beautiful course is a natural setting on a warm summer day, it almost seems like a crime to take a cart and ruin the atmosphere. If you are a golfer who enjoys the quiet walk down each fairway, the Taylor Made Quiver bag is a product you need to take a close look at. The Quiver bag is a throwback with some modern technology to bring it into the 21st century. It is truly a carry bag, with no stand mechanism or useless extra pockets. This bag sticks to only the essentials, and as a result it weighs just 2.2 pounds before you start loading it up. The bag does come with a double-strap system to take the pressure off of your shoulder as the round wears on. An easy-to-reach bottle pouch is found on the outside of the bag to keep your drink close at hand. Admittedly, this is a product that is best used in the dry months wherever you play your golf. 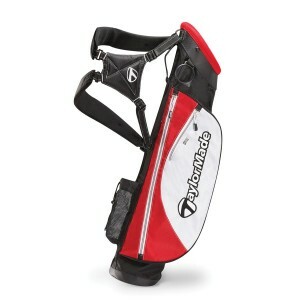 You will have to set the bag down between each shot, so wet turf and the Taylor Made Quiver bag don’t really get along. Also, because of it’s unstructured design, this bag will not really stand well-enough to ride along on the back of a cart. If you know you will be riding, better move your clubs bag to your full-sized bag for the day. With those drawbacks acknowledged, this is still a great product and one that is worth your consideration. Once you get used to the minimalist design, you will wonder why you ever put up with your large carry bag in the first place. The Quiver makes life on the golf course simpler – and that is something that we can all appreciate. Despite being a stripped down golf bag, there are still many of the features you have probably come to expect. You can find a padded valuables pouch for safe keeping while you play, and a hip pad where the bag falls against your side as you walk. The pockets are surprisingly large on both sides of the bag – big enough to hold as many golf balls as you want (need) to lug around the course. If the weather forecast is dicey, you can slip a jacket into the larger pouch just in case. Golfers who only hit the links when riding in a cart will not have much use for the Taylor Made Quiver, except for possibly as a driving range bag that fits in the car easier than a full-sized model. For those who love to walk, however, the Quiver is a product that can change the way you experience the game. Lightweight, simple, and well-made, this golf bag will be a joy to throw on your back hole after hole. If you live somewhere that has dry golf as the norm rather than the exception, investing in the Taylor Made Quiver is a decision you won’t likely regret.